When it comes to floor cleaning services for your business, you need a company that is effective and reliable enough to produce sparkling, sanitary floors throughout the facility. Failing to find a commercial cleaning company that can uphold a standard of excellence for the cleanliness of your facility can prove disastrous, from poor health for employees to poor first impressions by customers and clients. It pays to invest in professional carpet cleaning, and that’s where the Crystal Clear Enterprise team comes into play. For more than 20 years, our cleaning experts have worked diligently to create the best practices to optimize our results for your facility. Anyone in need of carpet cleaning services in Kansas City can benefit from our professional approach, delivering comprehensive outcomes that are sure to make you smile. One common problem we’ve seen in this industry is a lack of caring or concern for commercial floor cleaning services. Property owners think of their building’s carpets as the same as the ones at home, requiring little effort to maintain a clean appearance. 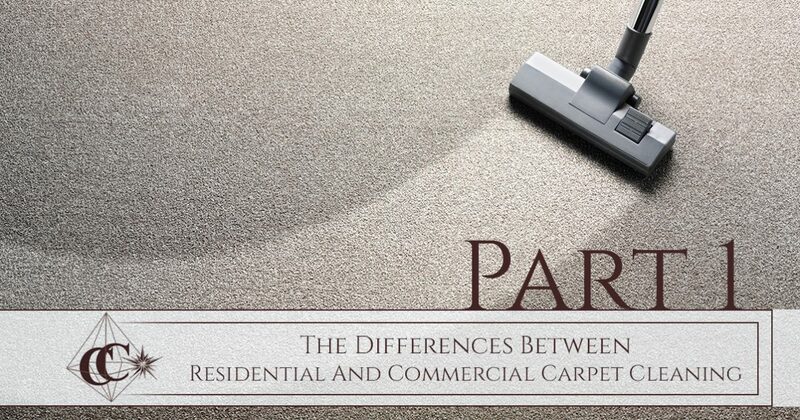 Today, we’ll begin to look into a few differences between residential and commercial carpet cleaning services. When done, be sure to contact our quality cleaning company to receive a quote for your building! Your workplace relies on utilitarian features to offer the best return for your investment. The homefront, on the other hand, typically places comfort as the top priority. Residential carpeting relies on a greater pile height to create a softer footfall for anyone traversing the surface. Carpet underlays are also focused on at home to create a resilient padding, absorbing sound while creating a luxurious surface that welcomes bare feet. The home is meant to serve as a sanctuary, and the loose-loop design of residential carpet helps to keep your floors comfy for the long haul. While comfort is important for commercial carpets, durability and performance takes the priority. This economical option focuses mainly on durability, assembling fibers in a way that provides the most protection from high levels of traffic. Often, designers will work to make their commercial carpets stylish and durable enough to remain stylish. Modern designs are placing an emphasis now on comfort to offer more benefits than what is standard for commercial flooring options. If you are expecting your company’s carpets to be as comfy as the ones in your home, though, prepare to be disappointed! While your home’s carpets are made to be plush and inviting, commercial carpet styles are designed with durability as the top priority. As we have stated, the high levels of foot traffic and heavier overall use of commercial carpets make strength and protection top priorities. The fabrics in your office will typically feature shorter pile heights, as longer varieties are more prone to being squished and damaged by foot traffic. Commercial carpets that go longer on the fiber length will lose their aesthetic perfection quickly, creating areas that look rough and worn-down. Residential carpets highlight these longer piles, creating more padding on top for your feet. The tradeoff, of course, being that home carpeting will wear out much quicker. The backing of your carpet will also determine its overall comfort and durability. Commercial styles are now featuring quality underlays that work to increase comfort and product longevity, resulting in ideal results for property owners. Reducing the strain that is put on your flooring will help to reduce the wear and tear. When it comes to the carpets gracing your floors, residential and commercial options will create vastly different cleaning needs. Next time, we’ll continue this topic by looking into the service differences of each industry and how they can affect your commercial carpet cleaning plan. If you are currently dealing with floors and surfaces that are soiled or inconsistently cleaned, be sure to reach out to the Crystal Clear team for assistance. Our industry experts have the experience and equipment needed to offer fast, effective results that minimize the downtime of your facility while optimizing the visual quality. Since 1997, we’ve dedicated our work toward providing top-notch carpet cleaning services to Kansas City businesses. Contact us today to receive or quote for your building!